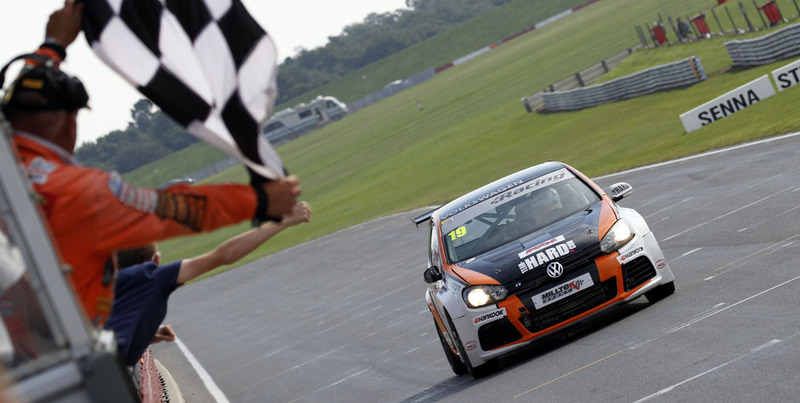 Pole position qualifier Bobby Thompson secured his maiden Milltek Sport Volkswagen Racing Cup victory in style at Snetterton 300 Circuit this morning, the Golf driver dominating Round 13 from lights-to-flag and also smashing the lap record in the process. With this weekend’s event providing a fresh challenge for the Racing Cup contingent by way of extended 30-minute races, tyre preservation was a key consideration but 18-year-old Team HARD racer Thompson had no such worries as he controlled the race from the front perfectly. Winning by 6.6 seconds, an unusually large margin in the ultra-competitive championship, his fastest lap of 2m 06.626 seconds (84.40mph) was a full 0.9 seconds inside the previous benchmark held by Aaron Mason. “The biggest thing I was nervous about was the start but we got that right,” said the elated race winner. “When I could see I wouldn’t have to defend at the first corner, I knew I could get a break and that’s how it worked. I said after qualifying, if I could get the lead I would be able to keep it. Joining Thompson on the podium were rallying star Robert Barrable, second place marking an excellent result on his first outing with Team HARD and, of course, a team one-two, while Jack Walker-Tully put his nightmare Brands Hatch weekend behind him with a fantastic third. 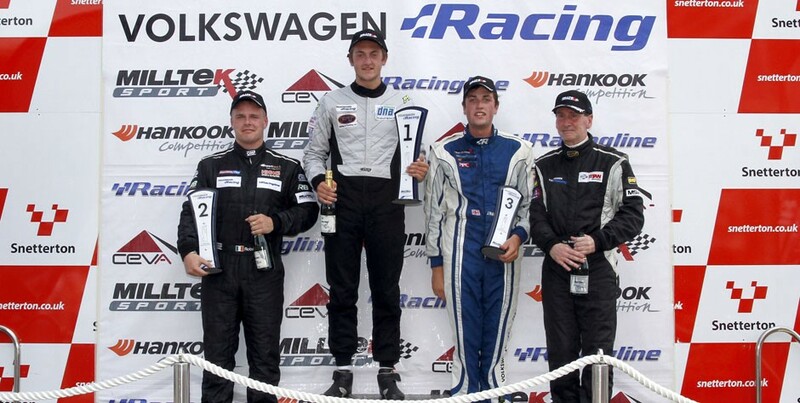 Walker-Tully, carrying 40kg of success ballast, was the highest placed of the lead five championship contenders, one place ahead of Joe Fulbrook, while Mason – second in the points coming into Snetterton – took eighth with the full 60kg of success ballast in his Scirocco. 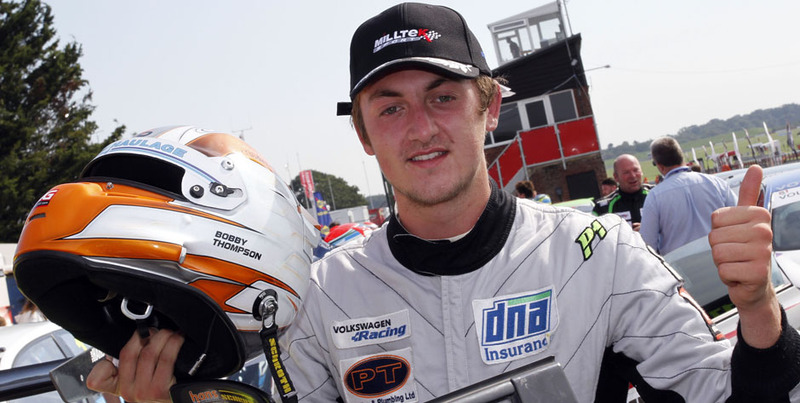 Championship leader David Sutton had to work his way through the order from the back of the grid as a result of missing qualifying due to his attendance at a wedding, and eventually took the chequered flag in 11th position – a gain of 11 places. The result still keeps Sutton at the top of the driver standings, but only by a reduced eight points from Mason. Making an almost faultless start from pole, Thompson had already built a near two second advantage after the opening lap as a huge battle raged over second place with Fulbrook working unbelievably hard to keep Walker-Tully, Phil House, Joe McMillan and Barrable at bay. Walker-Tully moved up into second on lap two but he wasn’t able to close the gap to the race leader with Fulbrook and the rest of the lead pack all determined to have a say. Barrable, working his way through impressively from seventh at the start, came fully into the picture on lap three at Agostini with a good pass on Fulbrook and he set about challenging Walker-Tully. At Montreal on lap four, the Irishman took his chance to move through and he was able gradually to edge clear on his way to a strong second. Walker-Tully did chip away by fractions mid-race, but Barrable was able to see off any potential threat comfortably. Third for Walker-Tully was by no means secure with Fulbrook and the ever-present McMillan heading a very tightly packed group including House and Lucas Orrock. McMillan moved into fourth on lap seven at Montreal but a slight mistake for the Scirocco racer at Oggies on lap nine enabled Fulbrook to make the most of the slipstream to the Esses – where he duly reclaimed fourth. Despite his mirrors being filled by McMillan to the finish on lap 15, Fulbrook held on impressively with House completing the top six. Michael Epps, from ninth on the grid, took seventh ahead of Mason with Simon Rudd ninth – despite a five-second track limits penalty – and Orrock, who lost pace over the final few laps, slipped to 10th spot. Championship debutant Andrew Duncan, at 57 the oldest driver in the field, took 16th position on his maiden outing with the Safe & Sound squad in a Scirocco, while category mainstay Tim Snaylam, who finished in 13th place, was awarded the Sportsman’s Trophy.